That unexpected spark- a special something that leaves you instantly feeling alert and alive and already looking forward to the next time. You never really know who you are going to make that connection with, but when it happens, let them know with sweet peas. This sweetly-scented bloom came into cultivation at the height of the Victorian era, when flowers were messages that carried meaning if words were elusive. In the language of flowers, the sweet pea was the letter sent to thank someone for a lovely time. If your last first date, important client meeting or new neighbor sparked a connection you’d like to commemorate, make sure they get the message with this sensational flower. Purple, pink, white, blue, or shades of burgundy, there’s a wide range of color choices for this dainty flower, which is typically 1-2 inches in diameter. 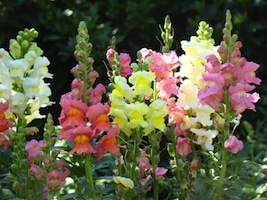 Most stems will have multiple blooms and display a unique shape with 5 petals that are strangely symmetric. The fragrance is sugary without being cloying and has a freshness to it that is hard to describe. With stems that are naturally climbing, one of the most alluring features of this flower are the tendrils typical to these leaves. 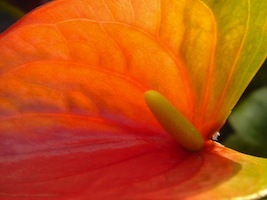 Used to help it climb towards the sun, the tendrils twist and turn like a line of calligraphy. Rather than add additional greens, ask your florist for stems that have extra leaves and add a certain story book quality to your bouquet or vase arrangement. Native to the island of Sicily and southern Italy, the sweet pea (Lathyrus odoratus) is a member of the humble legume family-Fabaceae. While not edible themselves, these old-fashioned ornamental blooms add nitrogen to soils with the help of a special bacteria called Rhizobia that can convert atmospheric nitrogen into a form that can be used by plants for healthy, green growth. This symbiotic relationship is an important biochemical cycle that keeps soils rich in nutrients and is a perfect symbol for the new relationships or partnerships you are developing yourself. 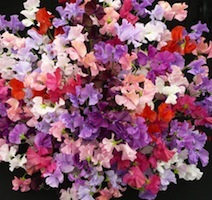 Sweet peas bloom in the late spring and summer, but are often available year round. Stunning in a solitary color tucked into a short vase, arrangements using sweet peas will add both fragrance and a finer texture to a mixed flower bouquet. Consider pairing with statice or lady’s mantle or mixing with a pastel colored spray rose. It is said the poet John Keats, himself a studied botanist, was the first to use the name “sweet pea.” While there’s no research to credit this, you can communicate the spark you’ve found in another with the gift of sweet peas and if any words are still needed, perhaps this verse from his “A Thing of Beauty is a Joy Forever” will suffice.